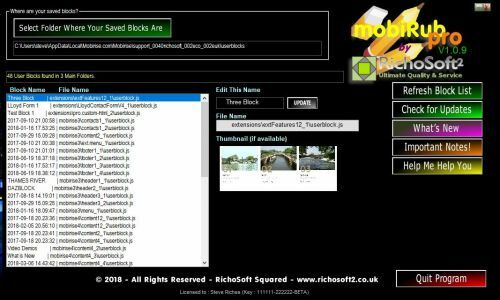 An easy to use program that will easily and quickly rename your user blocks in Mobirise to easily recognisable names! No More date and time names for user blocks!! Simply select the location of your User Blocks the program will retrieve all blocks. Select a block and view thumbnail (if available) enter a new name and click update. Job done! Just run the automatic set up program. VIP MEMBERS GET A SPECIAL PRICE OFFER - Log In to the VIP Members Area to get your Coupon Code!